Thank You to Led Astray for this lovely article. Last month we decided to change Ember from her puppy food over to adult food. I chose 4 brands which I was interested to try and got samples for each one. I did a lot of research about each product and after trying the foods, we decided Guru was the one for us. I hadn’t heard a lot about Guru, but I had seen a bit of hype on social media so I was interested to try it out. The food looks a lot like the pony nuts my sister feeds her horse, which Ember loves, and the pellets don’t feel greasy or crumbly like some we have tried. What interested me the most was the unique method Guru use to make their food. It’s called cold pressing and it allows the food to retain a lot of the nutrients important for dogs diets. ‘Guru dog food is as close to a dog’s natural diet as you can get!’. There are no additives or preservatives and the healthy diet is provides can help freshen breath, improve skin and improve behaviour. 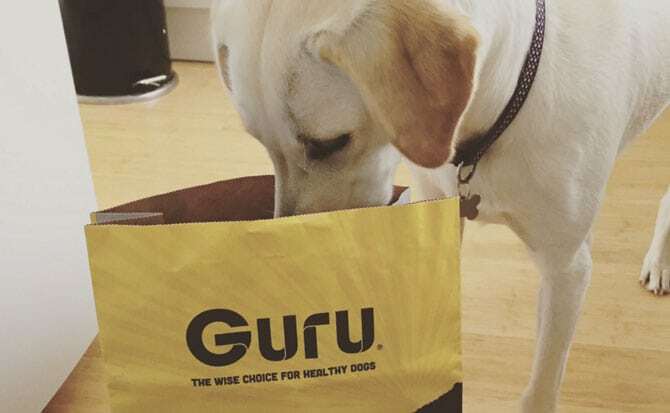 Guru also have a handy feeding guide on their website which tells you how much food your dog should be eating a day, based on their weight and you receive a measuring cup with your first order. There is also a video showing you how you can mix water with the food too. Ember loves this food. During the initial switch over period, she always ate the Guru biscuits over her others and after her first full Guru meal she went back over to her bowl once finished to ask for more. 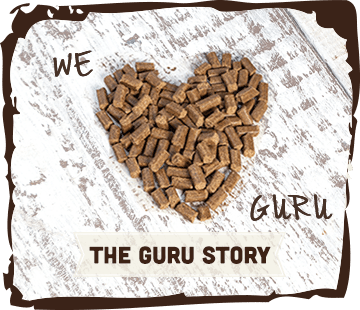 As a food obsessed dog it’s important for us that she is fed the best diet possible and remains fuller for longer and with Guru this definitely seems to be the case. The size of the food is perfect too, as Ember has a slow feeder bowl, some of the biscuits need more work to become free than over. This means she is not eating as fast and is improving her mental stimulation to get all the food out. We have started to see some improvements in Ember’s behaviour and we have also been able to maintain her current healthy weight and soft coat. 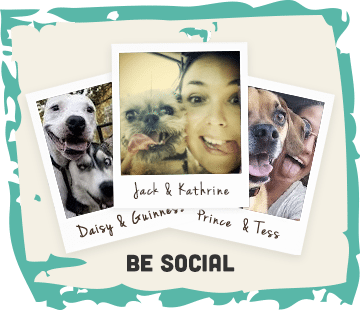 The flavour – surf and turf is great too and the packaging clearly states the ingredients and the amounts of each, along with the benefits they have. Pricing is decent as well, due to the fact that you don’t need to use as much food as normal kibble. £24 for a 5kg bag and £48 for a 14kg bag means that we are spending £1.03 a day on Ember who is 25kg. Not bad when you consider all the nutrition she is getting. 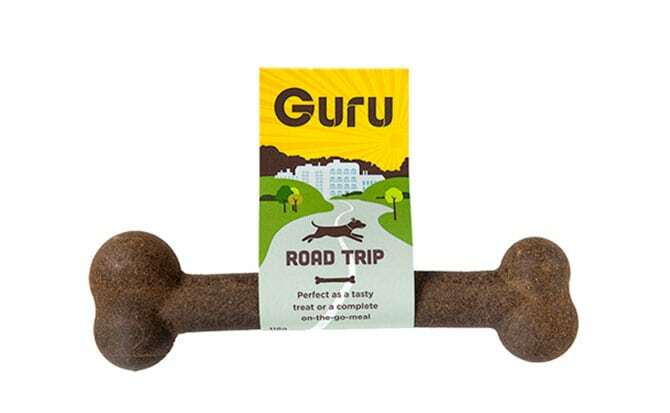 Guru also have field trip and road trip bones which can be used as a tasty, healthy treat or a complete meal for on the go, which we will certainly be purchasing for the summer adventures we are planning. Customer service is also fast and helpful and Lisa is so friendly! 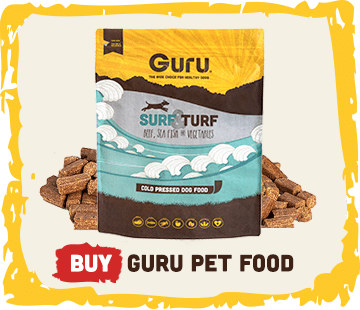 So if you’re looking for a new food or like us are changing from puppy to adult food, Guru seems like the perfect option.